Hanover, N.H. – Researchers at Dartmouth College have found a way to make back surgery safer, faster and more cost effective. The surgeon can use this new intraoperative stereovision system (iSV) without any additional radiation or labor-intensive marking of key areas on the patient's spine, to match up or co-register with the pre-operative CT scan, as some surgeons do today. This new mapping provides more accurate renderings of where spinal implants or other surgical tools and devices need to go during the procedure, and is expected to save up to 30 minutes, according to one of the study's authors, Keith D. Paulsen, PhD, Robert A. Pritzker Professor of Biomedical Engineering at Thayer School of Engineering at Dartmouth. 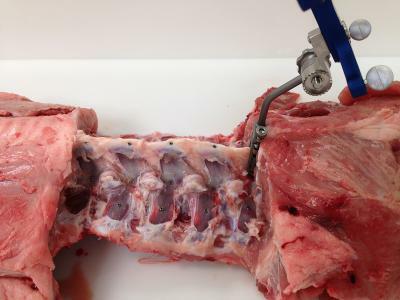 Paulsen and the multidisciplinary team at Dartmouth's Center for Surgical Innovation tested the new iSV system for accuracy and efficiency while operating on pig spines. Since completing this study, the team has taken its complex system one step further by converting it into a handheld "wand" that the surgeon can pass over the surgical area. "By rendering images real-time, with a simple handheld tool, we believe we can make surgeries safer and less costly in the future," said Paulsen. The findings are shared in the journal Operative Neurosurgery in a paper co-authored by Linton Evans, MD, Jonathan D. Olson, BS, Yunliang Cai, PhD, Xiaoyao Fan, PhD, Keith D. Paulsen, PhD, David W. Roberts, MD, Songbai Ji, ScD, and S. Scott Lollis, MD. Research reported in this publication was supported by the National Institute of Biomedical Imaging and Bioengineering of the National Institutes of Health under Award Numbers R01EB025747 and T32EB02196. The content is solely the responsibility of the authors and does not necessarily represent the official views of the National Institutes of Health.